It is well known that ice shelves on the Antarctic Peninsula have collapsed on several occasions in the last couple of decades, that ice shelves in West Antarctica are thinning rapidly, and that the large outlet glaciers that drain the West Antarctic ice sheet (WAIS) are accelerating. The rapid drainage of the WAIS into the ocean is a major contributor to sea level rise (around 10% of the total, at the moment). All of these observations match the response, predicted in the late 1970s by glaciologist John Mercer, of the Antarctic to anthropogenic global warming. As such, they are frequently taken as harbingers of greater future sea level rise to come. Are they? Last July (2012), I heard from a colleagues working at the edge of the Greenland ice sheet, and from another colleague working up at the Summit. Both were independently writing to report the exceptional conditions they were witnessing. 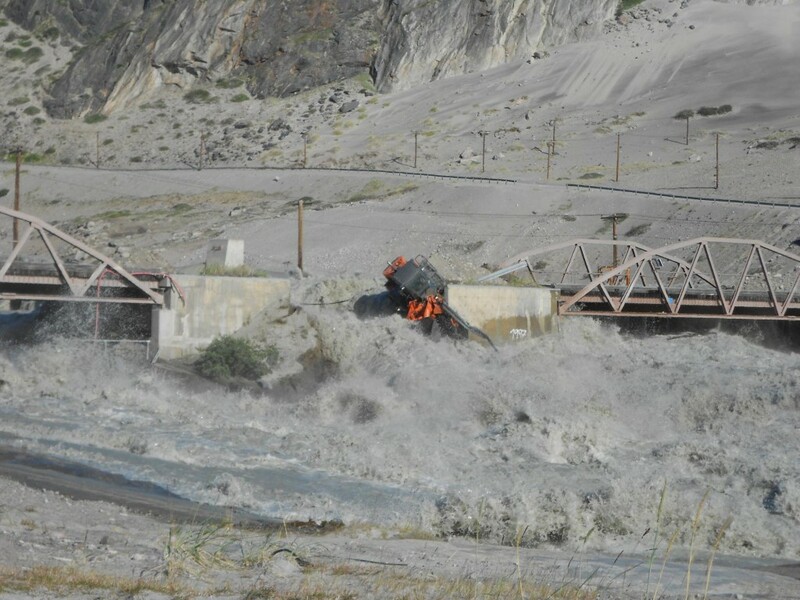 The first was that the bridge over the Watson river by the town of Kangerlussuaq, on the west coast of Greenland, was being breached by the high volumes of meltwater coming down from the ice sheet. The second was that there was a new melt layer forming at the highest point of the ice sheet, where it very rarely melts. I’ve been remiss in not writing about these observations until now. I’m prompted to do so by the publication in Nature today (January 23, 2013) of another new finding about Greenland melt. This paper isn’t about the modern climate, but about the climate of the last interglacial period. It has relevance to the modern situation though, a point to which I’ll return at the end of this post. Here a few of the videos of the named lectures from last week that are worth watching. There are loads more videos from selected sessions on the AGU Virtual Meeting site (the AGU YouTube channel has quite a lot more from past meetings too). All well worth the time. Satellite altimetry: measurements of ice sheet volume changes from laser or radar altimeters (e.g. IceSat) can be converted to mass changes through correction of spatially- and temporally-varying surface density together with spatial extrapolation to unsampled regions. The main limitation lies in the models used to correct for surface density changes. Input-minus-output: calculating the difference between the mass of snow accumulated and that of the ice (and meltwater) being discharged gives the mass imbalance. The snow accumulation is normally estimated from numerical models and the discharge is computed using the multiple of measured velocity at the edge of the ice sheet with its measured or inferred ice thickness and density. Thus, uncertainty in accumulation models and sub-glacial topography at the grounding line propagate into mass balance uncertainties. Satellite gravimetry: changes in Earth’s gravity field can be measured from satellite (e.g. from Gravity Recovery and Climate Experiment, GRACE) and used to determine changes in ice mass but only after accounting for mass-change effects that are not due to ice mass redistribution – in particular the glacial isostatic adjustment (GIA). Our recently published Nature paper (King et al, 2012), used GRACE gravity data to infer the ice mass trends as in previous work, but with an updated estimate of the GIA correction. 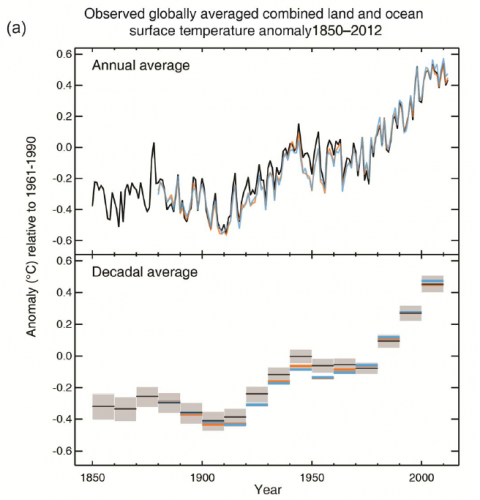 Antarctic Peninsula warming: natural variability or “global warming”? Most people know that the Antarctic Peninsula is one of the most rapidly warming places on earth. 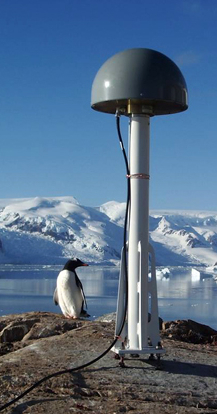 But like everywhere else in Antarctica, the length of available temperature data is short — most records begin in 1957 (when stations were put in place during the International Geophysical Year); a few start in the late 1940s. This makes the recent rapid warming difficult to evaluate; in general, what’s interesting is how the trend compares with the underlying variability. As anyone who’s been there can tell you, the weather on the Antarctic Peninsula is pretty wild, and this applies to the climate as well: year to year variability is very large. Put another way, the noise level is high, and discerning the signal requires more data than is available from the instrumental temperature record. This is where ice cores come in handy — they provide a much longer record, and allow us to evaluate the recent changes in a more complete context. By popular demand, a thread devoted to the continuing decline of Arctic sea ice, and a potential new record minimum this year. As before, the figures are hot-linked and will update day-by-day. Other links: Tamino, the very informative and detailed Neven’s sea ice blog , and some interesting predictions from Gareth Renowden.